"If a statue is ever erected to honor the person who has done the most for American investors, the hands down choice should be Jack Bogle." That's what Warren Buffett had to say about Vanguard founder John C. Bogle in his 2017 Berkshire Hathaway annual letter. John, who was better known as Jack, died today at the age of 89. At the time of his death Vanguard had $5.1 trillion dollars under management. That is not a typo. $5.1 trillion. It is the largest mutual fund organization in the world. By comparison, Warren Buffett's company (which, to be fair, is not a mutual fund) has a market cap of $486 billion, and that has given the Oracle of Omaha a net worth of $82 billion. So surely Jack Bogle was one of the richest people on the planet, right? A multi-billionaire several times over? Actually no. And it's not because he donated his billions to charity. It's because he never earned billions. And that's exactly why Warren Buffett considers Jack Bogle such a legend to be worshiped by millions of average investors around the world. "If a statue is ever erected to honor the person who has done the most for American investors, the hands down choice should be Jack Bogle. In his early years, Jack was frequently mocked by the investment-management industry. Today, however, he has the satisfaction of knowing that he helped millions of investors realize far better returns on their savings than they otherwise would have earned. He is a hero to them and to me." So what did Jack do to make him such a hero to Warren Buffett and also simultaneously NOT earn himself billions? Jack Bogle graduated from Princeton with a degree in Economics in 1951. His senior thesis was that active fund managers, people who hand picked stocks, did not actually outperform a passive index on its own. In other words, someone hand picking stocks for a portfolio wouldn't perform better than the market itself. Believe it or not, this was sacrilege at the time. Absolutely anathema to the generally-held beliefs held by basically everyone in finance at the time. Jack's first job was at a company called the Wellington Fund. Over the next two decades he rose the ranks, eventually becoming CEO. He was fired after leading Wellington into what turned out to be a very bad merger. Jack launched Vanguard in 1974. At Vanguard, he essentially invented the concept of passive index investing. Passive index investing gave any Joe or Jane Investor off the street the ability to invest in the stock market cheaply and easily. In those early days, anyone with a nominal amount of money could buy into the market and watch their money grow. The average mutual fund manager at the time (and still to this day) charged a fee just for the privilege of taking someone's money. They also took a percentage of all gains made on the money. The fees could easily add up to 20% or more of someone's money. Those fees enriched fund managers but more often than not left investors disappointed. Contrarily, the only fee Vanguard took from its customers was a relatively small administrative fee. Those fees would cover Vanguard's operational costs. They would not enrich the company's owners. In fact, Vanguard doesn't have an owner. It's not listed on a stock exchange. It is an independent, client-owned company with zero outside owners of managers taking profits or sales commissions. This little difference is the reason Jack Bogle did not die a billionaire. In fact, he did not even die a hundred-millionaire. According to an interview Jack gave to the New York Times in 2012, his net worth was in the high tens of millions, perhaps as much as $80 million. Being a low-cost fund is the reason Vanguard today has more money under management than any other fund on the planet. It's also the reason that, according to one estimate, more than 20 million people became millionaires thanks to Jack Bogle. And that likely never could have happened if those same people were investing in traditional funds that almost always performed worse than the market and definitely always charged big fees. Even when losing. "It was never my intent to build a colossus. I'm a small-company kind of guy. Turns out, when you do what's right for investors, money pours in." 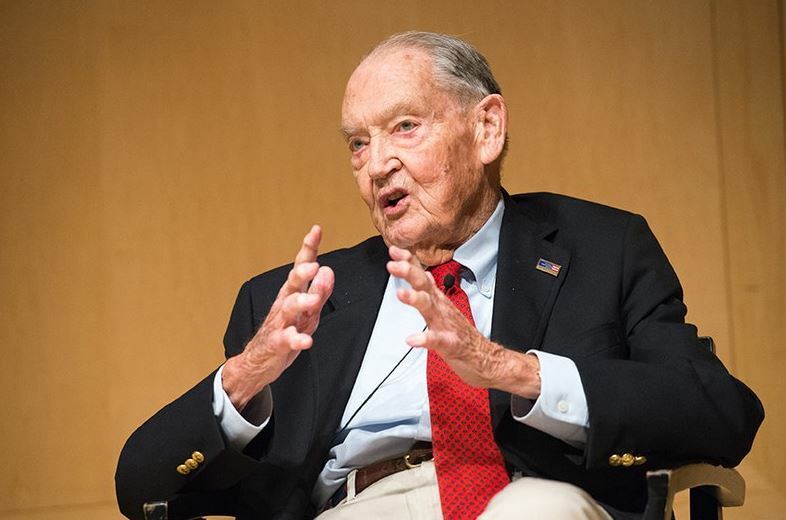 "Jack Bogle made an impact on not only the entire investment industry, but more importantly, on the lives of countless individuals saving for their futures or their children's futures. He was a tremendously intelligent, driven, and talented visionary whose ideas completely changed the way we invest. We are honored to continue his legacy of giving every investor 'a fair shake." So if you own an index fund or are a Vanguard investor, make sure you pour out a little liquor tonight in honor of Jack Bogle.